THE THREE “ESTATES OF THE REALM” in medieval England were the priest, the knight, and the laborer. 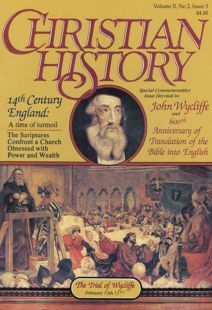 In a tract, written in English, John Wycliffe addressed all three. He showed how the lessons of the faith apply to the highest and the lowest. His tract is entitled “A Short Rule of Life, for each man in general, and for Priests, and Lords, and Laborers in special, how each shall be saved in his degree. ” The following condensation is adapted from Wycliffe’s original tract. “Third, think how God has saved you from death and other mischief... And for this goodness and mercy, thank God with all your heart. Pray him to give you grace to spend in that day, and evermore, all the powers of your soul (as mind, understanding, reason, and will) and all the powers of your body (as strength, beauty, and your five senses), in his service and worship, and in nothing against his commandments, but in ready performance of his works of mercy, and to give good example of holy life, both in word and deed, to all men about you. “Be well occupied, and no idle time, for the danger of temptation. “Take meat and drink in measure, not too costly, not too lickerish, and be not too curious thereabout. But such as God sends you with health, take it in such measure, that you be fresher in mind and understanding to serve God. And always thank him for such gifts. “Besides this, do right and equity to all men, your superiors, equals, and subjects, or servants; and stir all to love truth, mercy, true peace, and charity; and help all people to be in harmony with one another. “Most of all, fear God and his wrath; love God and his law, and his worship: and ask not principally for worldly reward ... but maintain a virtuous life. “At the end of the day, think about how you have offended God... and amend it while you may. And think... how graciously God has saved you; not for your desert, but for his own mercy and goodness ... And pray for grace that you may dwell and end in his true and holy service, and real love, and according to your skill, to teach others to do the same. “If you are a PRIEST, and especially a curate, live a holy life, surpassing other men in holy prayer, desire and thinking, in holy speaking, counseling, and true teaching. And that God’s commands, his Gospel, and virtues be ever in your mouth; ... and that your deeds be so rightful, that no man shall blame them with reason, but that your open deeds be a true book to all subjects and unlearned men, to serve God and to do his commands thereby. Living a good life stirs rude men more than true preaching by word only. And waste not your goods in great feasts of rich men, but live a humble life, of poor men’s alms and goods, both in meat, drink, and clothes: and the remainder give truly to poor men that have not of their own, and may not labor for feebleness or sickness, and thus you shall be a true priest both to God and man. “If you are a LORD, look that you live a rightful life in your own person, both in respect to God and to man, keeping the commands of God, doing the works of mercy, ruling well your five senses, and doing reason and equity, and good conscience to all men. In the second place, govern well your wife, your children, and your household attendants in God’s law ... that they may be examples of holiness and righteousness to all others; for you shall be condemned for their evil life and their evil example, unless you amend it according to your might. In the third place, govern well your tenants, and maintain them in right and reason, and be merciful to them in their rents and worldly mersements, and do not let your officers do them wrong, nor be extortionate to them. And chastise in good manner, those who rebel against God’s commands and virtuous life... And love, reward, praise, and cherish the true and virtuous of life, more than if you sought only your own profit. And reverence and maintain truly, according to your skill and might, God’s law and true preachers thereof, and God’s servants, in rest and peace ... And warn the people of false prophets and hypocrites that deceive Christians in faith, virtuous life, and worldly goods. “If you are a LABORER, live in meekness, and truly and willingly do your labor, that if your lord or your master be a heathen man, he, by your willing and true service, may not have to grudge against you, nor slander your God, nor Christendom (Christianity), but rather be constrained to come to Christendom. And serve not to a Christian lord with grudging, and serve him not only in his presence, but truly and willingly in his absence. Not only for worldly dread or worldly reward, but for the fear of God, conscience, and a reward in heaven. For that God who put you in each service, knows what state is best for you, and will reward you more than all other lords may, if you do this truly and willingly for his ordinance... And beware of wrath, of cursing, and of speaking in passion against man or beast; and ever keep patience, and meekness, and charity, both to God and to man.